Everyone gets nostalgic this time of year for fall flavors like pumpkin and gingerbread. 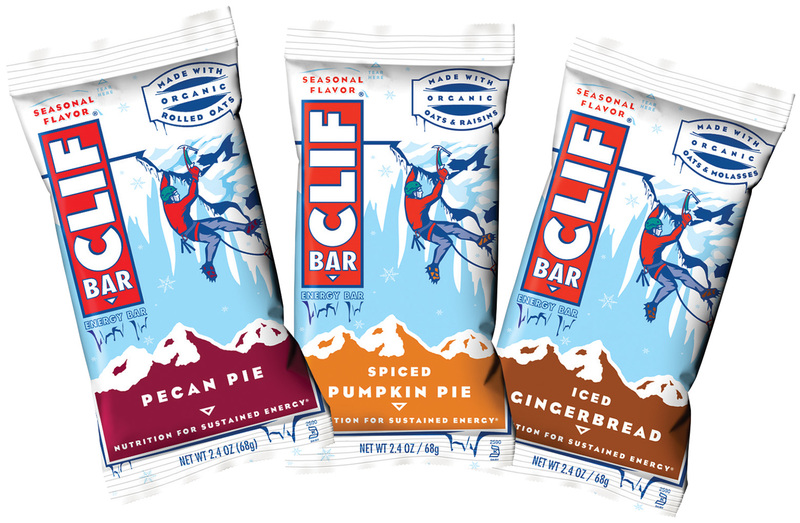 The folks who make the CLIF Bar aren’t immune from those autumnal cravings, reflected by their seasonal Iced Gingerbread and Spiced Pumpkin Pie energy bars, plus the new Pecan Pie bar. Like all CLIF Bars, Pecan Pie (260 calories, 70 from fat), Iced Gingerbread (250 calories, 50 from fat) and Spiced Pumpkin Pie (240 calories, 40 from fat) are made with 70 percent organic ingredients. They’re a good source of protein and fiber and have 23 vitamins and minerals. Suggested price for each 2.4-ounce bar is $1.39, and CLIF Bar will donate 1 percent of seasonal net sales to Protect Our Winters, a not-for-profit organization fighting against climate change. Clif Bar & Company only sources ingredients that are non-GMO. OXO (www.oxo.com) makes, among other things, kitchen utensils that are grip-friendly, especially for folks who have arthritis or other problems holding onto small handles. I’ve bought several of them for older relatives, things like peelers, ladles, etc., with good results. So when I was in the market for a sink mat, and saw one by OXO at a reasonable price ($8.99), I bought it. This sink mat was different from my last one, which was a plastic-coated wire grid. Though it had served well for many, many years, the plastic had given way in places and rust had crept in, so it was ripe for replacing. OXO’s version was raised a bit higher, with a nicely padded platform. It worked great. But after about a year, it began to show some mildew. It was made of two types of plastic, a rigid understructure and the softer padding. Where the two joined, the mildew had crept into the seam, where it was impossible (for me, anyway) to erase with scrubbing. So I emailed the company, explained the problem, and asked for their recommendations on how to clean the mat. What a wonderful offer! I tried OXO’s mildew removal suggestions first; but the mildew proved impossible to dislodge. So I took a photo and emailed it with my address, and a few weeks later, a brand-new mat arrived. Note that I hadn’t asked or even hinted for one in my original contact with the company. OXO went above and beyond to make a customer happy. Great job, OXO! Another story: A company that makes pancake syrup changed its bottle for one shaped like a rustic jug with a pouring spout or lip. Very cute. But when I used it, I realized that the pouring spout was just for show. The actual pour came through the top of the jug, where it dripped and was a bit messy. I called the company’s toll-free phone number and explained that the product was perfectly fine, but I had a wee issue with this “jug.” Perhaps, I suggested, pouring could be a bit easier with a spigot in the “spout” or a drip-proof channel on the top of the jug. Holy moly. There was no need to say that. A simple, boilerplate “Thanks for your feedback/We love to hear from our customers/We hope your future experiences with our product will be satisfactory” would have more than sufficed, would have kept their legal noses clean, and wouldn’t have needlessly turned off a customer. Give them a bit of background. (Note: A BIT.) Are you a frequent customer, or did you buy the product just this once? Do you generally like their product or service? Include relevant information about the product or service: time, date and place of incident, price paid, item or code number, use-by date, whatever identifying information you can supply. Exit gracefully. Thank them for their time and assure them that you will be awaiting their response. Don’t forget to give your contact information: email, street address, phone number. Do NOT rage, be insulting, threaten, or use inflammatory language. Remember, the folks at the other end are people, too. Give them an opportunity to make things right. You might be pleasantly surprised with your results. Laugh if you like, but I’m growing fonder of lima beans year by year. I was not a fan of lima beans as a child. They were the hated ingredient in the blocks of frozen succotash that were our family’s default dinner vegetable. They were mealy and dry, and far inferior to the corn niblets and green beans they accompanied. But now, after several years of experiencing limas transformed by amateur and professional chefs, I’ve come to appreciate them. They certainly are no longer the shriveled nubbins I remembered from childhood. Nope. I now know them as moist, inviting, satisfying and savory, not to mention nutritious, full of fiber and economical, as most beans are. This year’s contest allowed other kinds of beans besides limas, and entries included soups, dips, salads, stews, casseroles and pasta dishes, as well as several (yes!) desserts. According to Jean Bruns, a museum board member, this year’s turnout was 21 cooks entering 26 dishes. Dessert — Mary Dralle/Cooking With “Klibs,” Xocolatl Bars. 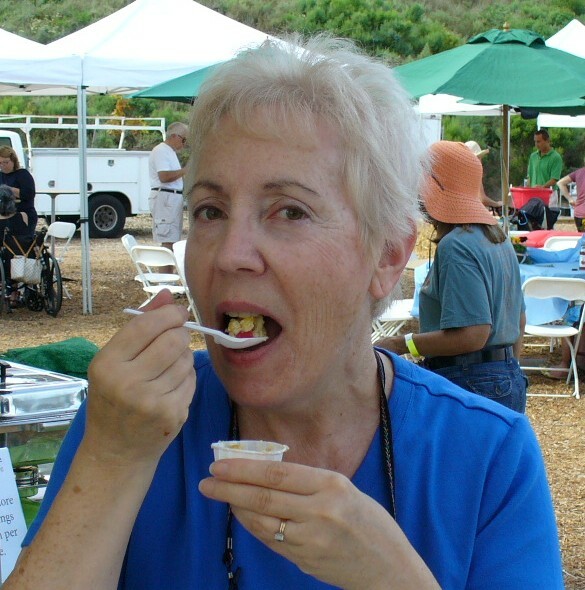 Winning recipes, as they have been every year, will be compiled in the group’s fundraising cookbook, soon to be available at the museum, 450 Quail Gardens Drive, Encinitas (760-632-9711). Sean O’Leary’s prize-winning soup was one of my favorites. He’s a former chef turned freelance photographer (www.simplysophotography.com). This recipe makes a LOT of soup, but you can cut it down for a smaller batch. The pork bone is for flavor, not for meat, Sean says. He adds that you can roast it beforehand for more flavor in the soup. Soak dried lima beans overnight in a 20-quart stock pot. Make sure water level is at least 4 times the volume of the beans. The next morning, strain the beans in a colander and set aside. After cleaning and preparing vegetables, rough-chop them. You don’t want to cut them too small. Place the dry 20-quart stock pot back on the stove and add some vegetable oil over medium heat. Let the pot get warm. Add celery, carrots, onions, garlic and chile, and sweat them until they are translucent by occasionally stirring them. This should take 8 to 10 minutes. At this point add reserved lima beans, ham, pork bone, parsley stems, green onions, paprika, cumin, oregano and chicken broth. Cover and bring to a boil, then turn down heat to low and simmer for 3 hours or until beans are soft. Remove pork bone and discard. Cool soup until it is about room temperature. It is best to cool soup as quickly as possible by placing pot in your kitchen sink. Surround the pot with ice and fill sink with cold water a quarter full. Stir soup to cool it faster. Once soup is cool enough, blend in a blender starting at low speed and working up to high speed until soup is smooth. Do small batches at a time. Reheat soup and season to taste with salt and pepper. Lime Creme: While soup is cooling, mix sour cream, mayo and lime juice as desired in a small bowl. Add a little water and salt until desired thickness and flavor. Kale Chips: Cut the leafy part off the kale stems. Now cut kale into desired size. In a saute pan, add vegetable oil to fill saute pan 1/4 full. Heat oil to medium-high. Place a little bit of kale in saute pan at a time. Be careful — the kale will splatter oil due to water content in the leaf. Pan fry kale until oil is no longer bubbling around the cut pieces. Remove from pan with a slotted spoon and shake over pan to remove excess oil. Place on paper towel to drain and season with a little salt while still hot. Set aside. Leek Threads: This is the exact same method as to make the kale chips. Slice the leeks crosswise into thin shreds and then pan fry. Once you have all the components ready, ladle soup into bowls and garnish with Lime Creme, Kale Chips and Leek Threads. Enjoy! In a large mixing bowl, cream the first four ingredients until fluffy. Beat eggs in one at a time, then fold in vanilla, creme de cacao, and dark chocolate chunks. On a large piece of wax paper, measure out all of the dry ingredients. (This method will ensure that all of the items are added.) Fold wax paper in half, pour into sifter and sift into bean mixture. Fold until all is incorporated. Press dough into a parchment paper-lined 11-by-17-inch jelly roll pan. Bake at 350 degrees for 30 minutes or until inserted knife comes out clean.